Zong introduces a reliable TV facility for its subscribers of Pakistan with the name Zong Mobile Media Mug. Now all the cellular operators who are connected with this network company can easily watch multiple channels of entertainment, sports and news by using it. This is an amazing feature has launched from this network side and in this busy sports season Pakistani cellular operators are demanding a reliable live TV service in cellular phones. As we all know Pakistan Super League (PSL), Asia Cup 2016 and Twenty Twenty World Cup 2016 are going to be launched and many cricket lovers Pakistani want to watch all matches through his/her cellular phone. Zong easily get understand a wish of its valued customers of Pakistan and finally it has launched an amazing Zong Live TV Service for its subscribers of Pakistan. All cellular operators who are using Android or iOs device can easily download this application from Google play store and ITune for watching countless channels with fastest service of this telecommunication. This service doesn’t only give facility for watching sports channel but subscribers can easily watch other entertainment, drama and news channel through this feature. It also provides option of its customers for listen countless FM radio channels with proper signals. Subscribers can easily avail multiple features by using Zong TV Offer. The details of this offer are mentioned as below. Customers can easily watch multiple channels live by using this application. 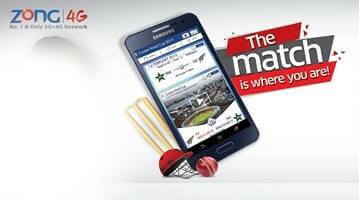 It provides facility to watch PTV Sports, Dunya News, Samaa News and many other more. It also gives opportunity of its consumers for watching favorite Dramas, Tele-films and Musics. Customers can get enjoy multiple Radio FM channels by using this feature. It gives FM Tehlka 94.6, FM Karachi 96 and many more FM channels facilities. It provides an exceptional facility of its users for adding favorite programs and serials and make own personal channel in this application without any extra charge. Subscribers can easily get News Alerts and further headline in this service. Customers can easily activate this offer through SMS just need to type SMS “MH” and send to 717 and receive download link of Zong Media Mug application. The name of Application is Zong Mobile Media Mug. Second option is: Android users can easily download this application from Google play store and apple users from I-Tune. The daily subscription charges of this feature are RS 6.00 plus tax. The application will utilize data bundle resources and consume the data bundle. It can also be used through Wifi service. Incase if the subscribers don’t have the Zong internet package so the normal data rate will be applied. This telecommunication reserves right to change charges and further incentives at anytime without specific notification. This service is only available for Zong customers.